Although the times and family make-up have changed dramatically, the foundational principles of intelligent parenting survive. Research has provided clear fundamentals that direct children toward confidence, security, and achievement. Furthermore, there are a fair number of day-to-day options available in raising children from which parents can choose. The children of this millennium will continue to be influenced by much more than their families; however, parents and grandparents continue to set the important foundations. I anticipate with enthusiasm sharing with my audience the cornerstones of raising happy, achieving children based on my many years of clinical work and my research with families. 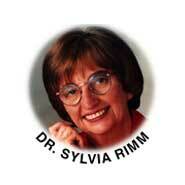 I have summarized my foundational advice to parents in my book Dr. Sylvia Rimm's Smart Parenting, in the main principles I share with our viewers on NBC's Today show, in my syndicated newspaper columns, and on my Family Talk public radio show. Take charge; don't overempower your children. Your children require leadership and limits to feel secure. Envision the letter V. When children are small, they're at the base of the V with few choices, little freedom, and small responsibilities that match their small size. As they mature, they should have more choices, more freedom, and more responsibilities. Freedom and responsibility should increase concurrently. Although limits remain, more freedom is provided. Children will feel trusted and healthfully empowered. If you reverse that V, however, and give children too many early choices and freedoms, they will believe they should have all the choices. They will resent rules and responsibilities and feel as if you're stealing their freedom when you don't give them a choice or you try to set reasonable limits. They will seek instant gratification, total power, and expect to be treated as adults before they're ready to handle the responsibilities of their overempowerment. In adolescence, ordinary expectations of responsibility will cause them to become angry, depressed, and rebellious. In plain English, they will act like "spoiled brats." Praise moderately to avoid pressure; postpone superpraise. Praise conveys your values to your children and sets expectations for them. A lack of praise conveys the message that you don't believe in them. Reasonable praise statements, like good thinker, hard worker, smart, creative, strong, kind, sensitive, set high expectations that are within children's reach. Words like perfect, the best, most beautiful, and brilliant set impossible expectations. Children internalize those expectations, and the expectations become pressures when children find they can't achieve those high and impossible goals. Don't discuss children's problem behaviors within their earshot (referential speaking). Discussion about children among adults also sets expectations for the children. If they hear talk between parents and grandparents or parents and adult friends about how jealous or mean they are, if they're referred to as "little devils" or "ADHD" kids, if they're constantly described as shy or fearful, they will assume adults are telling the truth and believe they can't control these problem behaviors. On the other hand, if they hear adult talk about their positive behaviors, their confidence will increase and so will their positive behaviors. Build resiliency; don't rescue your child from reality. Although children need protection, overprotection encourages dependency and oversensitivity. You can be kind without being oversympathetic. Your children will need to learn to recover from losses and failures, and independence and resiliency will permit them to triumph over obstacles. Stay united, be willing to compromise, and try to say good things about your child's other parent. Leaders in a family that lead in two opposite directions confuse children. Children will not respect parents who show no respect for each other. Describing your child's other parent as an "ogre" or "dummy" may make you feel like a good parent temporarily, but your sabotage will backfire, and your child will no longer respect either of you. This is especially hard after divorce, but it is even more important in divided families. United guidance also holds true for grandparents. It's important for grandparents to be supportive of their children's parenting and equally important for parents to be respectful of their own parents, their children's grandparents. Disrespect among adults in the family will be interpreted by children as parent permission to be disrespectful. Hold teachers, education, and learning in high regard. Set children's education as your first priority. That will become most clear if they hear how much their parents and grandparents value learning. Tell them about the best teachers you've had and elevate their teachers as well. Set expectations for higher education early so they will assume education does not stop after high school. Be positive about your own work and that of your child's other parent. If adults walk in the door and complain about their work daily, children will develop an "anti-work" attitude. They'll complain similarly about their own schoolwork and household chores. If parents don't like their work, they should attempt to find better work and remind children that education provides more job choices. Also, they can at least explain to their children that they are honest and responsible in their jobs. Be a role model of ethics, activity, and hard work. Locate other good role models for your children. Children watch their parents and grandparents. When adults "get away with" speeding, keep too much change, or are disrespectful to their mother (their grandmother), children will notice. When parents are interesting, ethical, and energetic, children will be equally impressed. Parents and grandparents can be good role models without being perfect. Other adults can be good role models for your children as well. Introduce your children to friends and potential mentors who can also be positive influences. Enjoy learning experiences with your child. Too many parents of 20-year-olds have sobbed in my office because they couldn't find time for their children when they were growing up. Make time for learning and fun with your children, and they'll be happy learners forever. Instead of regrets, you'll have only wonderful memories. Keep a separate fun time and adult status without giving your children adult status too soon. Enjoy some adult life without your children. Weekly dates and a few adult vacations a year will keep you excited about life together or with friends. Parents and grandparents should reserve time for adult conversations. Give your children something to look forward to. They can watch and wait and do child activities with the family. Permit yourself the enjoyment and adult relationships that you've earned by your hard work. Permit them the security of growing gradually toward adulthood.